Have = Do you have any money? Have got = Have you got any money? Have = I don’t have any money. 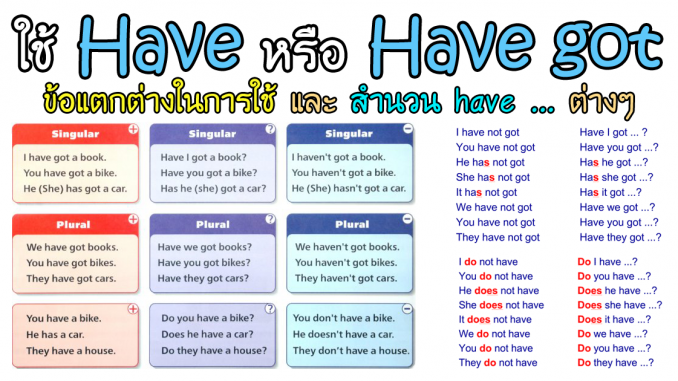 Have got = I haven’t got any money. She had long fair hair when she was a child. Did they have a car when they were living in Paris? I didn’t have a watch, so I didn’t know the time. She had long fair hair, didn’t she? Daniel doesn’t have a car. Do you have the address? ~ Yes, I do. Vicky has got blue eyes. Have you got a ticket? ~ No, I haven’t. Note that we do not use have got in short answers (No, I haven’t. ).